still can’t believe how I did it. Walking across the campus of St. F.X. and ended up in a wheelchair. Talk about recruitment tactics. sleep upstairs in my own bed. something more lucrative, a freelance poet. Well, maybe more satisfying. I love to row down the stream behind the century farmhouse in West Covehead, where I live with my husband Andy, who helped me get down the steep hill to my tiny rowboat with my cast still on. A section of my current manuscript is about the healing power of that small stream and pond. That manuscript became What Really Happened Is This: A Poetry Memoir, launched in November 2011. It won the 2012 PEI Book Award for poetry. To see a review from the Chronicle Herald of What Really Happened Is This click here. To read a review of Long Reach Home, click here. To visit my page at the League of Canadian Poets, click here. 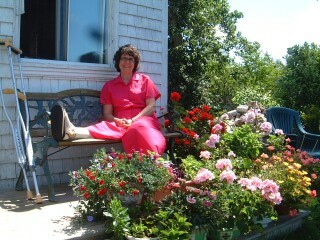 In February, 2013, I was appointed Poet Laureate of Prince Edward Island for a 3 year term. To reach the poet laureate’s website, click here. Dianne – I have some questions about your workshops. Could you please contact me?